SINGAPORE: Despite sluggish sales of new private homes, a residential site in Toa Payoh drew a massive 14 bids at the close of the auction on Thursday (Jun 18), indicating strong demand from developers for sites in mature housing estates. The Housing and Development Board (HDB) said the 12,154.6 square metre, 99-year leasehold site at the junction of Lorong 6 and Lorong 4 Toa Payoh attracted a top bid of S$345.86 million from a group that includes Evia Real Estate and Malaysia’s Gamuda Bhd. This works out to around S$8,130 per square metre of gross floor area, or about S$755 per square foot. The site is expected to yield an estimated 535 private residential units. Alternatively, developers may, with prior written approval, build a mix of flats and strata landed houses. HDB, as the Government’s land sales agent, launched the site for public tender on Apr 29. A decision on the award of the tender will be made at a later date after the bids have been evaluated, HDB said. Desmond Sim, Head, CBRE Research, Singapore and South East Asia, said the strong demand was “unsurprising” given the site’s location within a well-established mature estate with very few private residential projects. 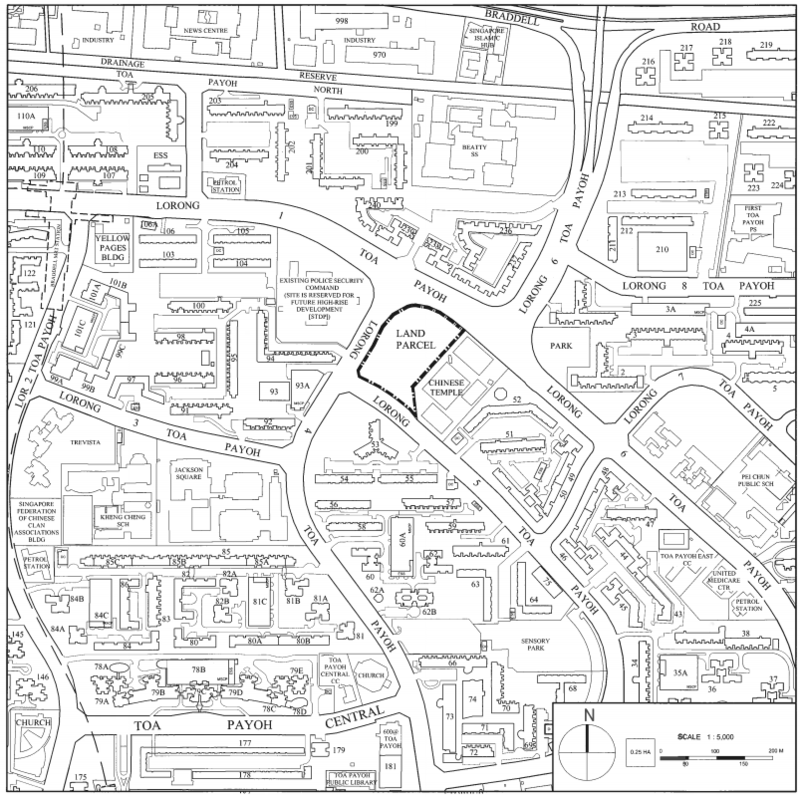 The site is also within walking distance of the Braddell MRT Station. The top bid was only 1.1 per cent higher than the second-highest bid of S$342.1 million, or around S$747 per sq ft per plot ratio (psf ppr) — the closest gap seen since the second quarter of last year, when a site in Choa Chu Kang Drive was awarded to Sim Lian Land at a margin of 2.2 per cent over the next bidder, noted Dr Chua Yang Liang, head of research and consultancy at JLL Singapore. “The tightness of these recent bids could reflect a more consistent view among the developers regarding market conditions going forward, coupled with the fact that the area is more mature and there is possibly more transactional data to help developers assess market demand more consistently,” said Dr Chua. Ms Christine Li, director of research at property firm Cushman & Wakefield, said the top bid also showed that land prices in the area had held up despite tepid sales in the primary market. She noted that the bidding was in line with the S$731 psf ppr for a parcel in Lorong Puntong in the Upper Thomson area. Ms Li expects the break-even price of the Toa Payoh project to be at around S$1,250 psf and the selling price to start at S$1,450 psf to S$1,500 psf. “Given that there have not been new private-home launches since 2009, this project should be well received by upgraders and first-time buyers if it is priced realistically,” she said. Evia has launched three executive condominium developments since its founding in 2010. It has sold 98 per cent of the 546 units for its latest project, Lake Life in the Jurong Lake District, since the launch in November. Register for the latest information on Club Gemini Residences by filling up your details below!